Don’t let lengthy coach journeys eat into your precious vacation days, save time and travel to Chichen Itza — one of the New7Wonders of the World — by plane from Playa del Carmen. Skip the 5-hour coach journey and fly over Mayan jungles with an archaeologist guide, arriving at the UNESCO-listed site before the crowds. Take a 3-hour guided tour of Chichen Itza and tick off highlights including the Kukulkan Pyramid and the Ball Court. Round-trip flights, hotel pickup and drop-off, and lunch are included on this small-group tour, limited to 10 people. Your full-day trip begins at 7am, when you’ll board an air-conditioned vehicle at your Playa del Carmen accommodation. Head to Cancun Airport and, after passing security, you’ll board a private plane destined for the UNESCO-listed Chichen Itza. During the 40-minute flight, you’ll glide over dense Mayan jungle and enjoy rare aerial views of Chichen Itza, an ancient Mayan site declared one of the New7Wonders of the World. 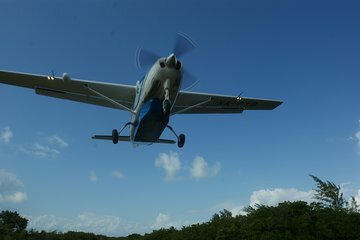 After landing, you’ll embark on a 3-hour tour of the archaeological site in a group limited to 10. Be captivated by history-rich commentary from your guide, who details Mayan rituals and depicts the prosperous city Chichen Itza once was. Capture photographs in front of the iconic Kukulkan Pyramid, also known as El Castillo, experience the mystifying acoustics of the Ball Court, and decipher the hieroglyphs that decorate the façade of the Temple of Warriors. Following thorough exploration, begin the return journey back to your Playa del Carmen accommodation, where you’ll arrive at around 4pm — leaving plenty of time to hit the beach.